There is often a special connection between women and their shoes (hence the existence of this blog). They're part of how we communicate and connect with the world. Think about it, how many of your experiences are tied to a particular pair? Well, the Sole Sisters documentary project will give you an opportunity to share at least one of those experiences (and maybe have it end up in the movie). 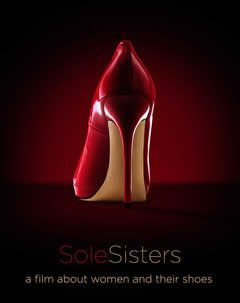 Produced by award winning documentary producer, Cynthia Salzman Mondell, Sole Sisters was inspired they way a pair of brand new red heels helped encourage her mother's attempt to recover from Pancreatic Cancer. Although Cynthia's mom didn't win her battle, she was inspired and decided to focus on the way women experience life in relation to their shoes. I'm considering submitting an "If These Shoes Could Talk" story. What do you think? Good idea? What story of your own needs sharing? While you think about it, click here and read stories others have shared.